100 Words, 100 Days: Day 8. On Secularism. | What I think About When I Think About Writing. ← You should date an illiterate girl. 100 Words, 100 Days: Day 8. On Secularism. You walk into McDonald’s and ask for a Big Mac and fries. Your server prepares your tray, gives you your food, takes your money, and says have a nice day (or words to that effect). This, my friends, is what is called a secular transaction. Your server cares not for your religious or political beliefs. He or she doesn’t care whether you have any or not. They’re not necessary for transactions of this kind. A secular society recognises that there’s a place for everything, and everything should be in its place. It is not anti religion or anti God. At least, it shouldn’t be. This entry was posted in 100 Days, 100 Words and tagged Big Mac, Christian, Islam, McDonald's, Muslim, secular, secularism. Bookmark the permalink. Meanwhile, you are walking away from the counter praying to God that the fools got your order right. It would be great if people kept their religious, political and I might add, sexual preferences to themselves, unless asked to share them. What’s mine are mine and what’s yours are yours! C) The “we’re right and they’re wrong” element of much of the morality in some religions encourages adherents to pronounce publicly on what they see as the immorality of other citizens, and to do so citing their sacred literature as a basis for their opinions. 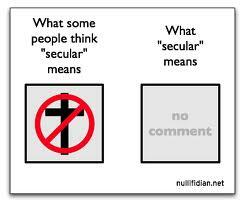 I like secular. It’s uncomplicated. A ‘no strings’ approach.